This is a guest post from the amazing Melissa Dinwiddie. I’ve been working with her off and on for several months and I think her story is instructive to many new artists. This is the first post in a series on how her art evolved into a thriving full-time business that supports her mortgage. I’m a professional artist. Critics may or may not like my work, may or may not call it “art,” but the fact is, I make my living from stuff I make, using my creativity. The road to where I am now hasn’t been an easy one, and it’s in flux. But if you dream of making a living from your art or creative thing, I’m proof that it can be done. I share my story here in the hopes that you might learn from my experience — the successes and the mistakes. When I was a little girl, my parents were sure I’d grow up to be an artist. I loved to draw and paint, and the curlicues I drew on the ends of all my letters led to a family joke that I must be the reincarnation of a Medieval monk. I went in other directions, though, pursuing a dance career until an injury ended that dream while I was studying for a BFA in New York at Juilliard. For a long while I was utterly lost. I spent several years casting about for what to do with my life. I finished school at UC Berkeley, taught nursery school, got a masters (in an aborted attempt to pursue a PhD), got engaged, and used the impending wedding as an excuse to avoid figuring out what to do with my life. Little did I know that the marriage wouldn’t last, but the wedding would ultimately launch a new career. Since we had a Jewish wedding, we would be incorporating a ketubah (Jewish marriage contract) into the ceremony, and we decided to commission a local ketubah artist to create a custom ketubah for us. After the wedding it was time to fish or cut bait. My husband earned enough money for both of us, so I didn’t have to get a job or make a living, but I didneed to find a direction. I thought perhaps I’d be a writer (after all, wasn’t that what I spent most of my time doing in school? ), but the process of trying to write felt like pulling teeth. Fifteen minutes at the keyboard seemed like hours. So I found a way to procrastinate. Intrigued by the papercutting that one of the ketubah artists we met used in her pieces, I started making papercuts. Hours would fly by and feel like only fifteen minutes. My friends and family were delighted by the pieces I was making. When I took some papercuts to the frame shop they raved too and asked if my work was for sale or on exhibit anywhere. They even referred to my pieces as “art”! Huh? I wasn’t an artist! Could these pieces I was making be art? Inspired, I entered a couple of my papercuts into shows, and they were accepted. Lesson #1: art is in the eye (and pocketbook) of the beholder. Even if you don’t think your work is art, or of value, somebody else might! It began to dawn on me that perhaps this new thing I was sinking all of my time into might turn into a little hobby business. My entry into the world of commissioned art was impressive only in how little I was paid. My best friend was looking for a gift for her babysitting clients, who were expecting a new baby, and asked how much I would charge to make a special piece for them. Knowing she didn’t have a lot of money, and that the piece would take me many hours to create, I insisted on doing it for free, to start building a portfolio. But she insisted back that she wanted to pay me. So I charged her the same amount she would have spent to buy a gift in a store: $25. The piece took me 40 hours. Another friend saw photos of that piece, and commissioned a papercut as a gift for her 3-year old daughter. This one took me only 10 hours, and earned me $100. A much better rate, but even back in 1995 this was still not a living wage. However, I was getting a lot more validation and pleasure from making my papercuts than from writing, so I decided to take the hint and follow my passion. At the time I couldn’t imagine that papercuts by themselves would be very marketable (I’ve since met a number of papercut artists who proved me wrong), but remember those curlicues on the tips of my letters? I always loved calligraphy, so perhaps if I learned how to letter, I thought, I could incorporate that into my work, maybe address envelopes and fill in certificates, and maybe, eventually, even make a ketubah! I dove into calligraphy and art classes all that year (1995), and started accepting any calligraphy jobs that came my way: filling in baby books, addressing envelopes, calligraphing poems with added decoration/illumination, designing wedding invitations, you name it. Meanwhile, I kept making pieces just for fun, I showed my work wherever I could and garnered some awards. And in 1996 I got my first ketubah commission. And earned $700 for a piece that took me 70 hours. Obviously my hourly rate wasn’t improving much! A few ketubah commissions later and I was honestly ready to retire. I worked so hard, and the pay just didn’t compensate me enough for my time and talents. I was actually resenting my clients! That’s when it occurred to me (duh!) that maybe I didn’t need to retire; maybe I just needed to raise my rates! Lesson #2: Don’t undervalue your work! Anytime you start feeling resentful about the work you’re doing, it’s time to reset. If you truly don’t enjoy the work, maybe it’s time to just stop doing it. But if you enjoy the work and just don’t feel well-compensated enough, raise your rates! Since my husband’s income paid the bills, I had the luxury of letting my business grow organically. And it did. I wasn’t making a living, but as long as I made enough to pay for my classes and supplies, I was fine. Then my marriage fell apart, and I knew it was time to get serious. To add to my repertoire of marketable skills I enrolled in classes on Photoshop, Quark, InDesign, Illustrator and web design. By this point I had a website and was taking commissions from clients all over the country, but my income was totally unpredictable. I never knew when the next big commission would come in. When it rained, it poured, but then there would be long periods of drought. I was afraid to say no to any project, which led to crazy weeks of nonstop working, and feelings of burnout. I knew I needed to create a more stable income stream, and in 2001 I decided to try selling my art as prints. I’d been getting requests for less expensive versions of my custom ketubot, and when I got several emails in a row about one particular custom ketubah on my website, I bit the bullet. I started taking orders for this yet-to-be-made ketubah print, and spun myself into a tizzy getting it done in time for the first couple’s wedding. Lesson #3: preselling your work creates an enforced deadline, which may help get more work done. It can also create a lot of stress! I will not kid you: creating my first ketubah print was a huge amount of work. Not only did I have to create the art, but I had to compose several different versions of the wording, have them all translated into Hebrew, calligraph all the different versions, have the art and the calligraphy scanned, and thendeal with the pre-press and printing. The stress of having to do all of this on a tight deadline nearly killed me, but my pre-sales paid my out-of-pocket expenses, and at the end of it I had a print for sale on my website! This one ketubah print sold quite well. All by itself it certainly didn’t make me a living — I was still making most of my money from commissions, plus some teaching — but it made me realize that if I had a whole line of prints, maybe a dozen or more, I could actually make a sustainable income from ketubah print sales alone. In 2002, for the first time in my life, I was supporting myself entirely on my own, from my art. I spent the next several years building up my line, while at the same time still taking any commission that came my way. As my line of ketubah prints grew, my income did become more stable (though still seasonal, since most ketubah sales happen during “wedding season,” ie, spring and summer). On the other hand, I also worked longer and longer hours. And I had less and less time to spend making art just because I loved it. I found myself wishing I could retire from doing commission work. But I still didn’t make enough from print sales alone to stop accepting commissions, and I was still afraid to say no to a guaranteed check. And since most of my commissions were for weddings, they had hard deadlines. It was only a matter of time before I ran myself into the ground. 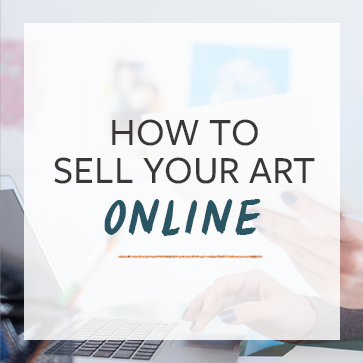 The shift you describe from “You’ll buy this?” to “They buy these!” should be encouraging for anyone considering selling art for the first time. I’m with you Jonathan – I can’t wait to read the rest. I just got the next installment and I’m getting ready to read it. It’ll post later this week! Lovely post & your guest has a nice fluid writing style. I’ve always fancied the idea of trying to make art and sell it so these types of stories are very cool to hear about. Thanks Ben! I hope you’ll make that art and put it up for sale, even if you don’t have any interest in making your living from it.